What Reynaldo is known for, of course, is his pottery that is decorated in the tejido pattern, or cloth-texture design. 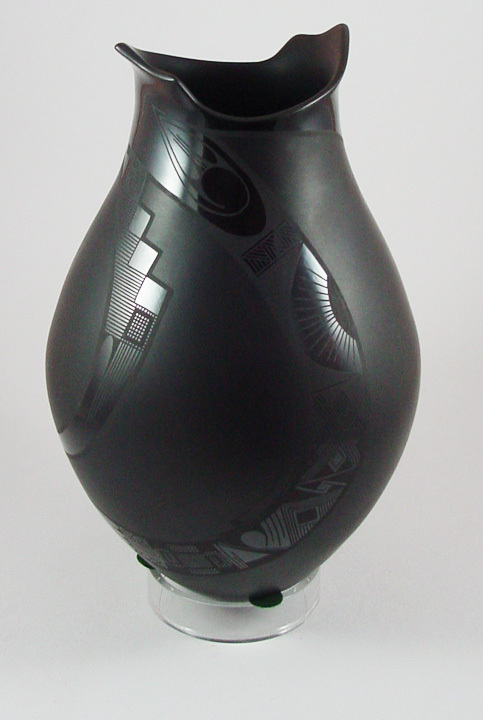 Tejido-decorated black-ware by Reynaldo are his trademark and the Bombiya shown here illustrates that very well. 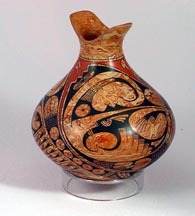 This is large bowl with a fluted neck and the tejido decoration throughout. 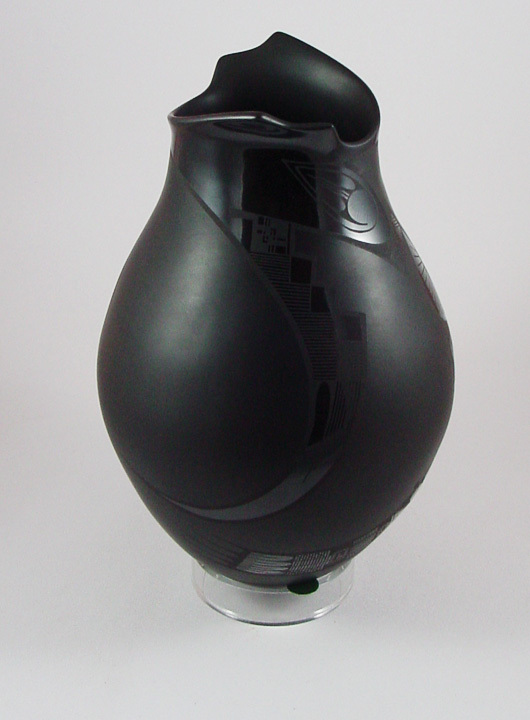 The bawl is quite large and very impressive, measuring 15 inches in diameter and 5 inches deep. 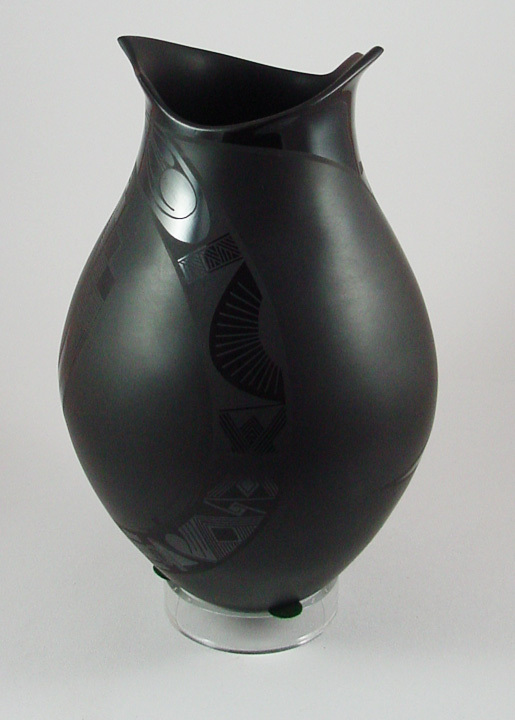 The bowl is incised on both sides, inside and out, and is signed by Reynaldo. 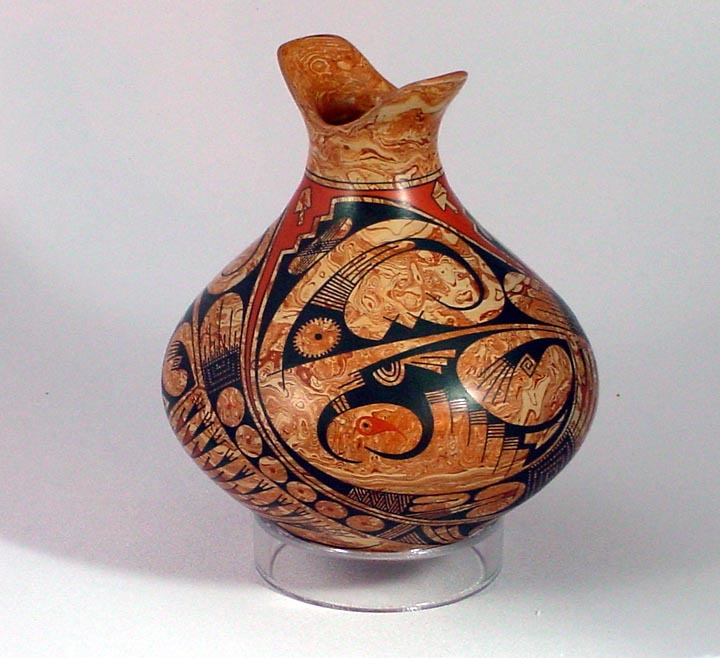 Mata Ortiz pottery hardly comes in more elegant fashion than this piece. 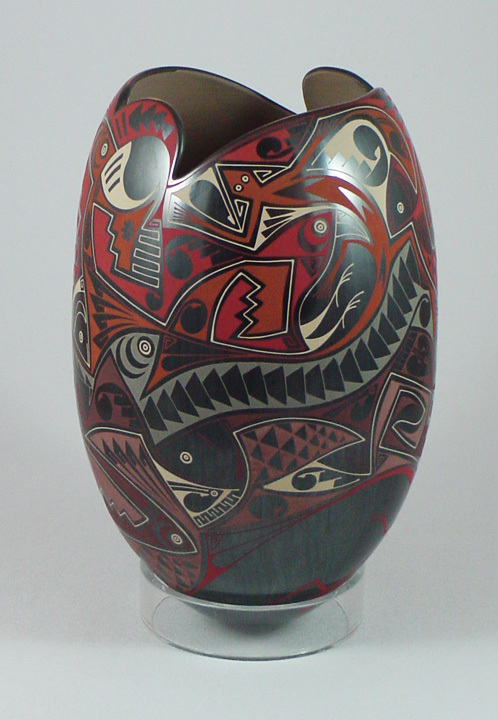 This very large, very impressive olla was hand made by non-other than Lydia Quezada and measures a full 12.5 inches high by 8 inches in diameter. The most striking part of this piece is the decoration. 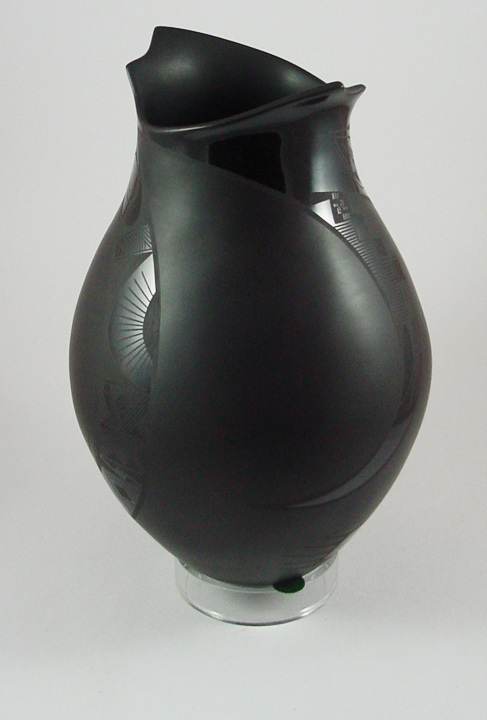 Lydia is well known from her black on black pottery that is made with highly polished designs on a matte black background. 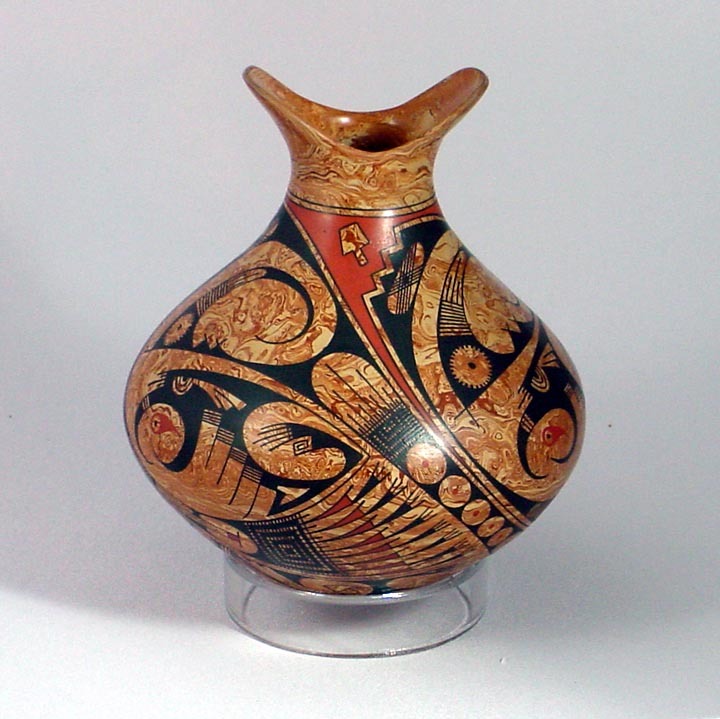 The decoration is a signature design for this distinguished potter. 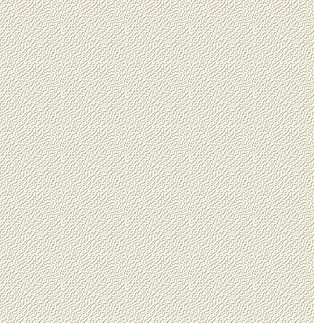 The spectacular sheen polish is achieved after repeated rubbings with a stone. Lydia polishes for a few hours, lets some three hours or so go by, and then repeats the process. It takes several polishing sessions to achieve this high-gloss effect. Lydia and her equally talented husband, Rito Talavera, are featured prominently in the authoritative book The Many faces of Mata Ortiz. It devotes four full pages to these master potters, beginning on page 155. 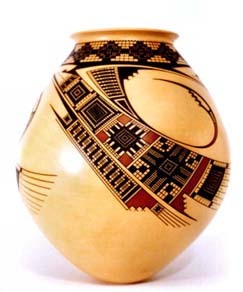 The son of a bus driver, (his father operates the public bus that runs daily between Mata Ortiz and Nueva Casas Grandes) Luis Martinez Lopez began making pottery in his mid teens and has developed into one of the most original potters and decorations of pottery in Mata ortiz. 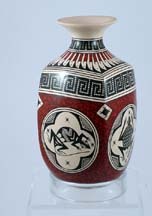 His pots formed in the shape of a square with bulging circular areas on the side and decorated by Paquime-type animal figures are famous. 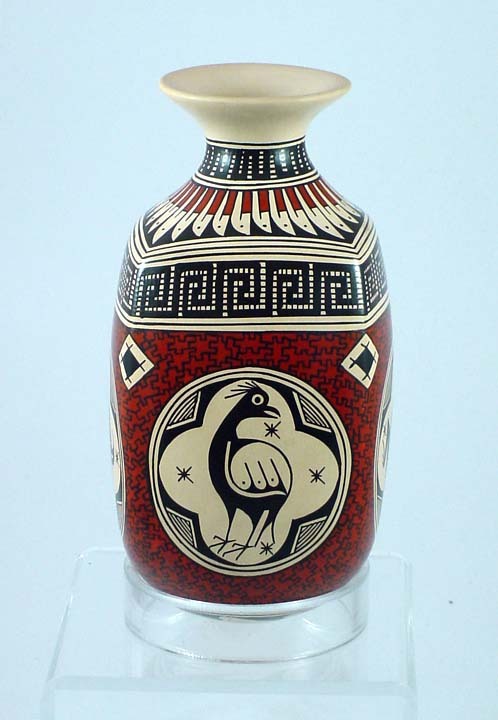 In addition, his cuadritos (small squares) are impeccably drawn and painted, rivaling in perfection the work of such renowned potters as Hector Gallegos. 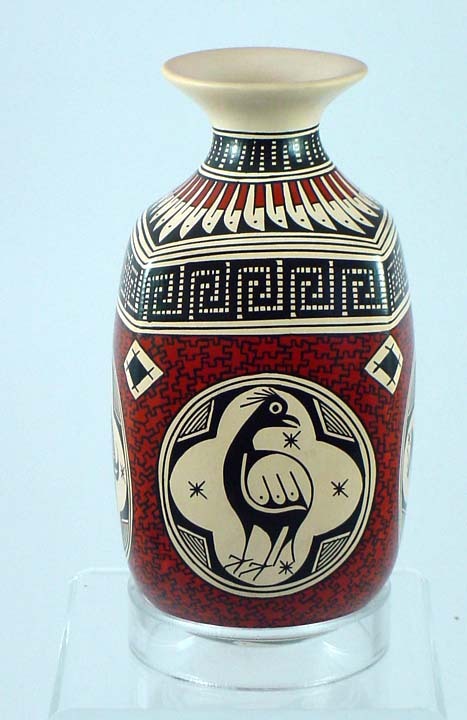 The olla shown here is just another example of the art of this remarkable potter. It is also very large, measuring a full 8 1/2 inches tall by 6 inches in its maximum width. 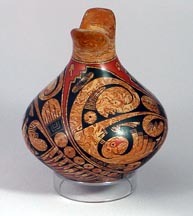 It is decorated with four Paquime-style animal figures, including two geckos, a turtle, and a bird that seems to be a grouch. The husband and wife team of Cesar and Gabby Dominguez are among the most prolific and creative in the village of Mata Ortiz. They have traveled extensively in the US giving demonstrations. They were selected by the Idyllwild Arts Academy in California to continue with the summer pottery workshops that Juan Quezada used to give there. Iddyllwild continues with them the summer tradition that began in the 1950's bringing the best artists in their fields to teach under the pines, such as Maria Martinez, Lucy Lewis, Blue Corn, and Amado Pe�a. Cesar and Gaby make some of the best plates in Mata Ortiz. They won Second Price, in the Concurso Artesanal for one of their plates. 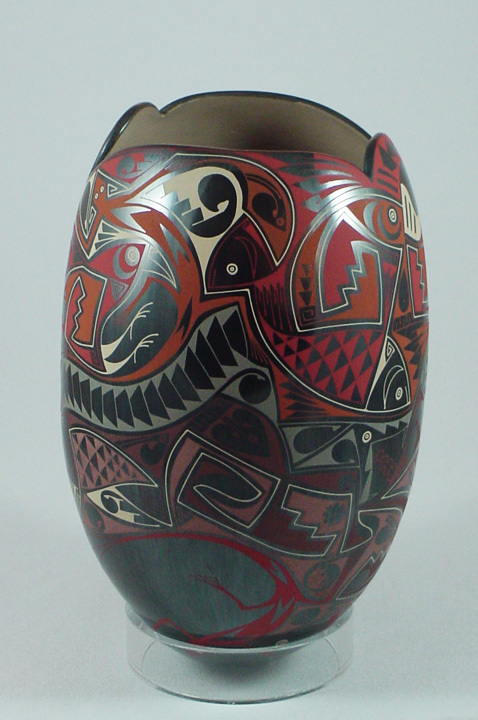 Cesar Dominguez is an acknowledged master potter. 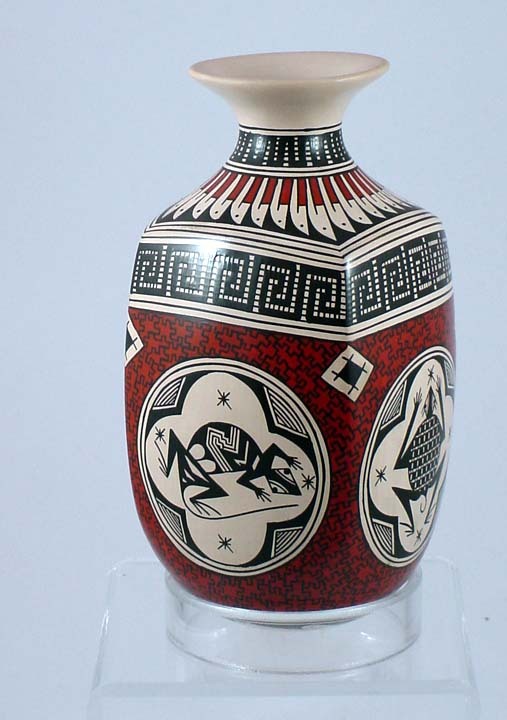 His pottery is widely collected and he wins ribbons in judged competitions, even in Mata Ortiz. 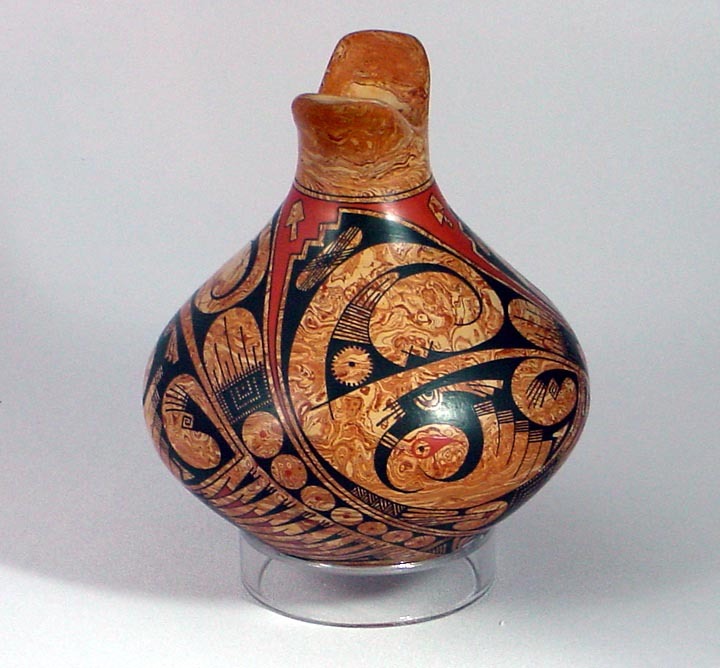 His repertoire is huge, from differently colored, intricately decorated stone-polished ollas, bearing painted images of various animals or fine line, to plates, to bowls, to marbleized pottery. Cesar and his wife, Gabby, who works with Cesar as a team, are featured prominently in the authoritative book The Many faces of Mata Ortiz, page 62. The present vase measures 7 3/4 inches high by 7 inches in diameter at it widest part. 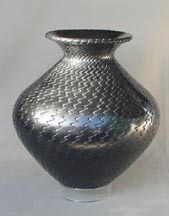 It is made in the marbleized form-achieved by mixing three clays together but not quite homogenizing the mixture before making the pot and firing it. 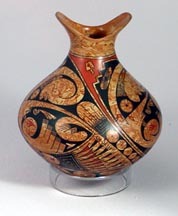 It is decorated with sweeping bands that contain fine-line work in the best of the Quezada style of decoration, along with stylized images of parrots, feathers and other geometrics. 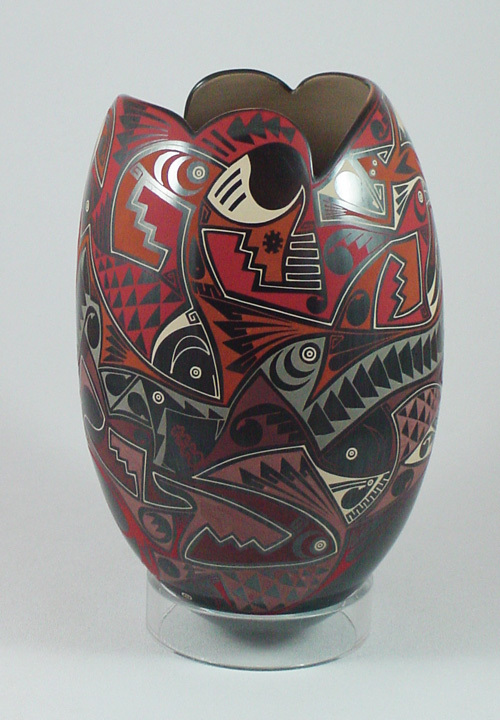 This is a very large, stunningly beautiful piece of pottery by Eli Navarrete, one of the most famous potters in Mata Ortiz. This is a very large piece by Eli, measuring 10 1/2 inches tall and 8 inches wide and its brilliance provides an excellent example of Eli's prowess as an artist. The design shows a flow among its parts, giving the pot integrity and a holistic appeal. The very large size of this pot makes it special and a highly desirable from a collector's point of view.